9" x 12" sign made of knotty pine. Beveled edges and routed slot in back for hanging. Makes a great gift! This sign is a nice size at 18" long x 7" high. It's made in the U.S.A. from solid knotty pine. Features beveled edges and a routed slot in the back for easy hanging. This summer dress is perfect for wedding season! It's available in small, medium, and large. 100% rayon. Made in America! Quality, style, and sentiment! This genuine leather bracelet is handcrafted in the Ozarks. It is studded with Swarovski Crystals. In the center, you will find a FAITH hand stamped plate. The pictures just don't do justice for how beautiful this bracelet is in person. 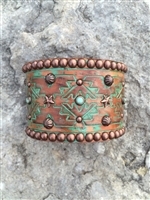 Each bracelet by The Rowdy Cowgirl is one of a kind. No one else will have one just like yours. Measures 8" long x 1.5" wide. Snaps at 7.5" in length. One of a kind! Stunning genuine leather bracelet, handcrafted by artisans in the Ozark Mountains. This piece is a real head turner. It measures 9" long by 2" wide. Adjustable snap closure from 7.75" to 8.5". Fast and free shipping! Copyright © 2012 Dirt Road Diva Boutique. All Rights Reserved. Built with Volusion.